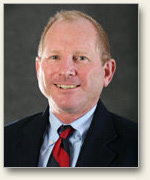 Ron Pierce has practiced law in private law firms in Southern California for over 35 years. Since 2010, while continuing to maintain a part-time private law practice, Ron also has served Griffith Company as its General Counsel. He continues to represent clients on construction, employment, and commercial contract issues, including dispute resolution and litigation. In particular, he has significant experience with complex construction disputes, including mechanics lien, stop notice, surety bond, delay, impact, disruption, inefficiency, extra-work, differing site conditions, bid-protests, subcontractor substitutions, terminations, and other construction claims and lawsuits. Ron is an active member of the Associated General Contractors of California’s Legal Advisory Committee. He is a graduate of the University of California, Berkeley (A.B., Phi Beta Kappa) and of the UCLA School of Law (J.D., Moot Court Honors Program). For over 30 years, Martindale-Hubbell from LexisNexis has rated Ron as “AV PREEMINENT, 5.0 out of 5.0,” the highest standard for both legal ability and ethical standards, and a top-rated lawyer in both construction and employment law.